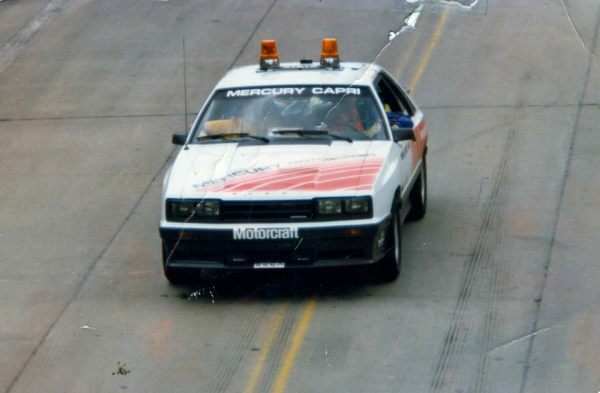 During 1984 the Mercury Capri dominated the SCCA Trans Am Series. Mercury took the manufactures title winning 12 of 16 races. Driven by Willie Ribbs, Tom Gloy & Greg Pickett, the Capri would finish 1, 2, & 3 during the Detroit Trans Am race on June 23, 1984. 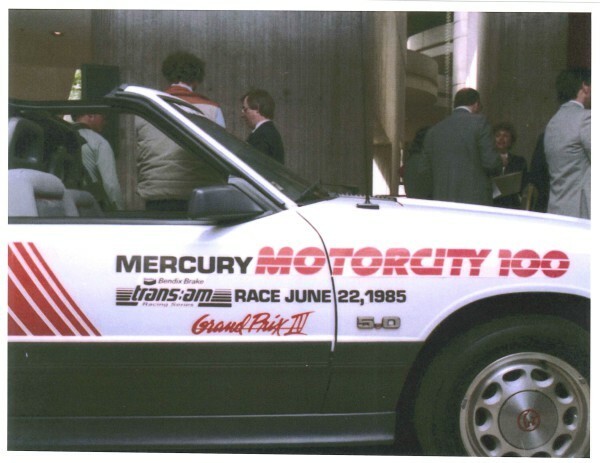 In 1985 Mercury would be awarded sponsorship of the Detroit Trans Am race known as the Motorcity 100. The race would be run on June 22 during the Detroit Grand Prix weekend. 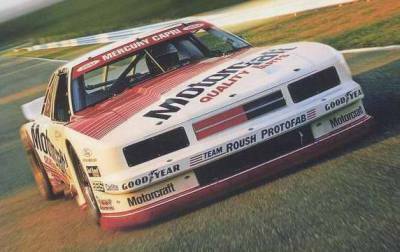 Mercury took advantage of the previous year’s success of the Capri on the track & chose the Capri RS as the pace car. 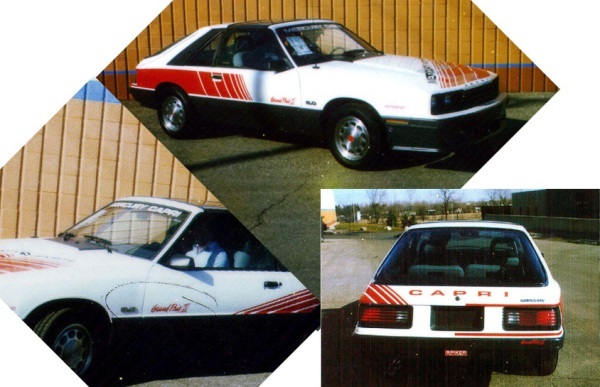 It was to be styled like the Roush Protofab SCCA Capri’s, receiving similar graphics & paint schemes. As with most pace car’s, replica’s would be built and sold at dealerships. 100 replicas were scheduled to be built for the Motorcity 100. Mercury then approached ASC McLaren. In 1984 & 1985 ASC McLaren had been modifying Capri’s into upgraded coupes and convertibles just as Shelby had done in the 60’s. They would be brought in to help design & modify the Motorsport Capri. In the March a white Capri 5.0L was pulled off the lot of Spiker Ford/Lincoln/Mercury in Milford, MI and sent to Graphix Concepts in nearby Novi. This car would serve as the prototype. Graphix Concepts would design and add the decals. Each side of the prototype would have a different decal style. The driver's side had red strobed stripes starting below the door molding and becoming taller in size as they reached the back of the car, then wrapping around onto the rear hatch. This style closely resembled the Trans-Am Series Capri's. The passenger side had vertical red stripes only on the white section of the car & less sloped than the other side. The reasoning for the 2 different decal styles was to give Mercury 2 different choices. The passenger side scheme ultimately would be chosen. The prototype would then be stripped of the decals that weren't chosen & given a new decal to match the other side of the car. ASC McLaren then added their components. Since the Motorsport Capri & the Motorcity 100 was to be a showcase for Mercury, the cars would not get the full treatment ASC McLaren coupes or convertibles received. Just the rear wing, ground effects & light covers would be added. The ASC McLaren name was nowhere to be found. Unlike the ASC models, all cars would retain all of the factory emblems. The prototype was then approved for production. Ford then ordered all cars on April 11. Pictured above left at Graphix Concepts with both decal designs. This was prior to ASC McLaren added their features to the car. .
Pictured above right, the prototype in completed form featuring the ASC McLaren features at their facility in Livonia. The red & white F ord/ Lincoln/Mercury Motorsport decal had yet to be dropped from the design. 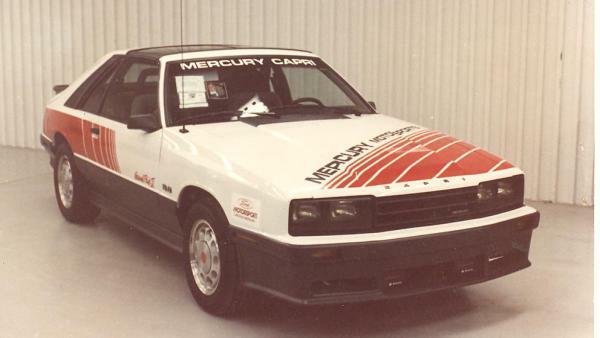 By this point all Mercury Capri production was over 2 weeks behind schedule at the Dearborn Rouge plant. Mercury then decided to trim the number of cars down to 50, but even then they had to use some silver cars to make that mark. Mercury wanted to put the ASC McLaren features on themselves at the Rough Plant. This was quickly abandoned as ASC McLaren was also behind schedule on the coupes & convertibles they were modifying & were having issues with available parts. 9 white cars came off the production line in Dearborn on Friday May 24, the day before the holiday weekend. The first 6 cars from this batch, all with solid roofs, were shipped to ASC McLaren following Memorial Day. From this group of 6, the pace cars & safety cars were chosen for conversion with additional decals & other modifications such as light bars & radios. The rest would become replicas. The bulk of the remaining cars were built in Dearborn on May 29, 30 & June 1. The following week the last of the cars would be completed on June 4, 7 and June 11. The cars would be shipped to ASC McLarens Livonia, MI facilities in batches with the last group arriving on June 12. After conversion, they were then shipped to the Renaissance Center parking garage in downtown Detroit beginning June 14. An additional car started its production prior to the others (except the prototype) but was not completed until June 14. This was to become the pace car for the Detroit Grand Prix. After Shipping to ASC McLaren June 14 for the basic decals & add-ons,It was sent off to another facility (probably Roush in Livonia, MI) & a specially prepared engine would be installed for track use. It was built without any factory options. It would also receive a mag mount antenna, Cibie light becons, additional decals & other features needed to be used as a pace car. While at the race in downtown Detroit, the cars would serve different purposes. 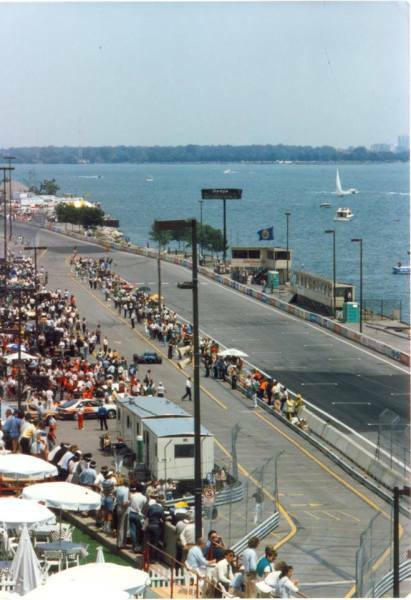 The track cars would serve as pace cars & safety cars for both the Motorcity 100 & Detroit Grand Prix. Others would serve at displays set up by Mercury, used in parades and given to executives or track officials as transportation. Pictured above left: The prototype at the Renaissance Center during the pre-race news conference. While at the RenCen it had additional decals on a overlay. Pictured above right : The safety car on the track at the Motorcity 100 on Saturday June 22. The cars were part of a drive away program organized by the Lincoln-Mercury Detroit dealer district. The program was similar to other events Ford had been known for in the past such as the 1970 Twister Mustang / Torino drive away for Kansas City dealerships. After the race weekend was over, Detroit district dealers would drive or transport the cars back to their respective dealership. The cars would then be used in the show room to draw in prospective sales for the summer of 1985. All would be sold as new cars. Dealerships would mark up the cost around $1400.00 over sticker price.